As arborists, the team at Twelve Oaks is here for you, especially in you a time of need. 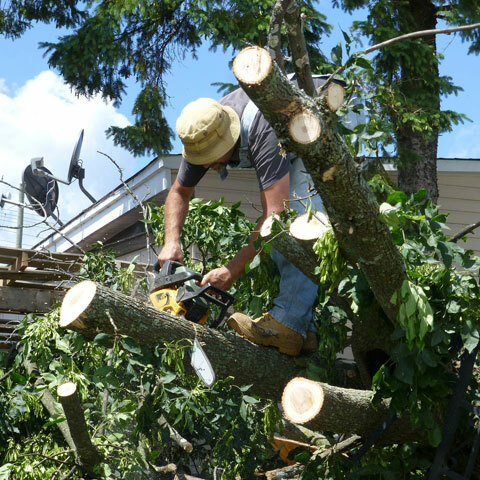 We know that living in Canada the weather can be unpredictable and that's why we provide emergency tree care and clean up caused by storm and wind damage. Damage can easily occur during any type of severe weather condition where changing conditions can put stress on trees. In summer, soil can be dry or very water saturated causing the roots to lift, and branches to droop and weaken from the wetness. High winds can blow and detach branches from the tree, and have them fall to the ground, or even uproot a weak tree altogether. With our Canadian climate, we cannot forget about the effects of snowfall and ice. The heavy weight of snow and ice can damage branches and disrupt the tree's composure when the weight gets too much. SHOULD I HAVE MY TREES INSPECTED? Mother nature can be unpredictable, and that's why it is best practice to have the trees in your yard inspected before the weather decides to have a temper tantrum. By having a storm risk assessment, arborist’s can detect if your tree is already a potential hazard when extreme weather does occur. The arborist can perform preventative maintenance on trees to help reduce risk caused by unforeseen weather conditions. It's easy to decide that trees can be dangerous due to their reputation of toppling over during high winds, and severe weather, but the truth is a healthy tree can take a lot of abuse from the climate and still remain strong and stable. Damage caused to trees by the hand of Mother Nature is not always preventable. If damage does occur immediate action should be taken if the damage caused to your tree poses an immediate danger to your home, and loved ones.